How predictable is the globalist imperial agenda? Are we witnessing the final stages of a long-term plan to induce another economic recession and erect a new high-tech police state throughout Europe and beyond? All they needed was a pretext. While the mainstream media performed its normal routine of emotive reporting, stoking general fear and spreading mass hysteria, some smaller independent media outlets were busy plotting the establishment’s latest crisis agenda. When the Paris Attack news broke last week, 21WIRE’s Patrick Henningsen went on television late Friday evening to comment on the unfolding drama, and also to analyze what was was likely to happen in the coming days and weeks in the wake of this event. France declared its first nationwide state of emergency since 1961 (when it attempted a coup d’état during the Algerian colonial war). Initially, this week’s snap passage of the emergency powers law only provides for a 12 day period, but on Monday French ministers confirmed this would be extended to 3 months because they believed that French citizens “had a right to a safe Christmas.” It gets even worse. After closing French borders, President François Hollande then proceeded to accelerate new police state measures after declaring publicly that, “We are a nation at war”, and then called for suspending normal due process by canceling search warrants, imposing curfews, traffic bans, and even authorizing local governments to impose a ban on public demonstrations. It seems the President has traded in his nation’s liberty for security theatre. In addition, over 100,000 police and soldiers have been deployed throughout the country. France is now under Martial Law. In predictable knee-jerk fashion, the French government seized upon this opportunity in order to insert more of its their military assets into the Syria conflict by launching airstrikes on Sunday night in the area surrounding Raqqa, Syria, allegedly striking a multitude of “ISIS targets”, including command centers, weapons depots, and ISIS ‘Oil Assets’ – all thanks to supposed intelligence provided by the US. However, reports suggest that the impressive display of French air power didn’t actually net any real ISIS casualties. One can only wonder how so many ‘high value targets’, especially ISIS oil assets (we’re told this is so crucial to ISIS funding), could suddenly be made available to the French by a US military that claims to have been conducting round-the-clock airstrikes over this same region… for the last 14 months. This only reinforces many people’s suspicions that the US-led Coalition “Anti-ISIS(ISIL) Campaign” has been nothing more window dressing for a covert agenda, where the US and its allies have actually been working in concert with both ISIS and al Qaeda in Syria in order to achieve a long-held policy of toppling the Syria’s government, ala regime change in Damascus. To date, Washington’s multi-lateral proxy, NATO (North Atlantic Treaty Organization), has not been able to legally wiggle its way into Syria to help the thousands of foreign fighters and terrorists (like NATO did in Libya in 2010-2011) who have been allowed to flood into that country since 2011. Currently, the US and its allies are engaged in a illegal, undeclared war in Syria, and the US are desperate to find some legitimate avenue to pursue their military ambitions after having failed to cheat their way into Syria via a staged false flag ‘chemical weapons’ event in Aug 2013. According to NATO article 5, an attack on one member state is deemed an ‘attack on all’, and thus automatically triggers a joint military action (war) by the NATO collective against their declared enemy. Already, a number of political figures have cried out for ‘Article 5’ war powers, including former NATO head Anders Fogh Rasmussen who claimed that, “I do believe that the attacks on Paris qualify for an invocation of Article 5.” He added, “It was an attack on an ally and we know who the attacker is.” (certainly, they know the attacker much more than they are letting on). Eager to see a wider military deployment from Washington, US Senator Marco Rubio has called for ‘an Article 5’ too. Absent of any official NATO route, however, France has simply gone ahead and invoked an obscure ‘Mutual Defense’ pact hidden within the EU charter. The clause is called Article 42.7 of the Treaty on European Union which states that, “If a member state is the victim of armed aggression on its territory, the other member states shall have toward it an obligation of aid and assistance by all the means in their power.” Job done. Bombs away. As 21WIRE first reported last year, the ‘No Fly Zone’ meme has been coming out of every available orifice in Washington since 2013, and this popular US tool for military intervention still draws the affectionate gaze of Democratic Party war hawks like Hillary Clinton, as well as the endless column of Republican war hawks who are in the pocket of the military industrial lobby. Whether its Jeb Bush, John McCain, or Lindsey Graham, they never get tired of the No Fly Zone. Just like the No Fly Zone, ‘Conservative’ Republican war hawks have been desperate to implement another old chestnut – by throw thousands of young US men and women at a problem which the US has actually created. War hawks in Washington DC have predictably seized on the Paris Attacks as an opportunity to reignite calls for “boots on the ground” in Syria. Amazingly, they are now claiming that massive deployment of troops “worked really well” in Iraq and Afghanistan. 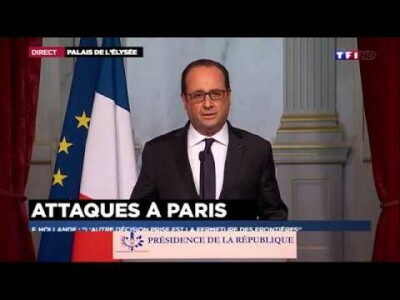 Early Saturday morning, Hollande’s first move was to ‘seal’ France’s borders, supposedly to catch the terrorists. This ’emergency’ move also comes at the height of Europe’s co-called ‘Migrant Crisis’ (a crisis that’s actually been engineered by the US and Europe). Rather conveniently, one of Friday the 13th’s said ‘suicide bombers’ was allegedly carrying a fake Syrian passport, which somehow led the French government and the western media to conclude that the Paris Attacks were a result of the ‘Migrant Crisis’, claiming the terrorists has sneaked into the country as refugees. To date, this only an official conspiracy theory, but that hasn’t stopped politicians and ‘security experts’ from using this crack-pot theory as justification for a European lock-down, prompting some European leaders to call for an end to freedom of movement across Europe. As expected, politicians looking to appear ‘tough on terror’ and the growing gaggle of security lobbyists, and other assorted corporate fascists, have called for something akin to a ‘European Patriot Act’ – an end to the ‘Post-Snowden’ debate over bulk data collection and privacy – covering issues like NSA and GCHQ blanket spying on all citizens, and imposing more regulations and government monitoring of mandatory manufacturer ‘back doors’ for computers, mobile phones, gaming consoles, and also calls to make encryption illegal (except for government of course). This hasn’t hit the headlines yet, but you can be sure that the usual gang of security contractors are putting the final touches on their proposals from a new regime of biometric ‘real IDs’. Expect announcements before the week’s end. Back in August 2013, British MPs rejected Cameron’s call for bombing Syrian government forces in a close vote. It turns out that MP’s made the right choice as that war would have been waged on false pretenses. As predicted on Friday last week, David Cameron has now promised a new “comprehensive strategy” to win MP’s Parliamentary votes for an open-ended UK bombing campaign ISIS in Syria and Iraq. Cameron claims he wants to, “do the right thing for our country” (fancy that), and hit the “head of the snake” of ISIS in Raqqa, Syria. What military impact the UK would make in a multi-nation war in the region is debatable, with an air force of about a dozen Typhoon fighters and a handful of operational naval vehicles. Make no mistake about it – the British defense industry would like nothing more than to see this happen tomorrow – along with increased defense spending and procurement. Job done. Bombs away. We’d rather none of these had come true, especially this quickly, but it only goes to show just how transparent the new world order agenda really has become.